In the gradebook, there is an option to toggle the display by clicking on the box icon beside the course name. Clicking on the icon will allow you to change the format to Full view, Aggregates only, or Grades only. The default display is Full view, which displays both the grade items and course total. Some users inadvertently click this button and then be missing either the course total or all of their individual grade items. 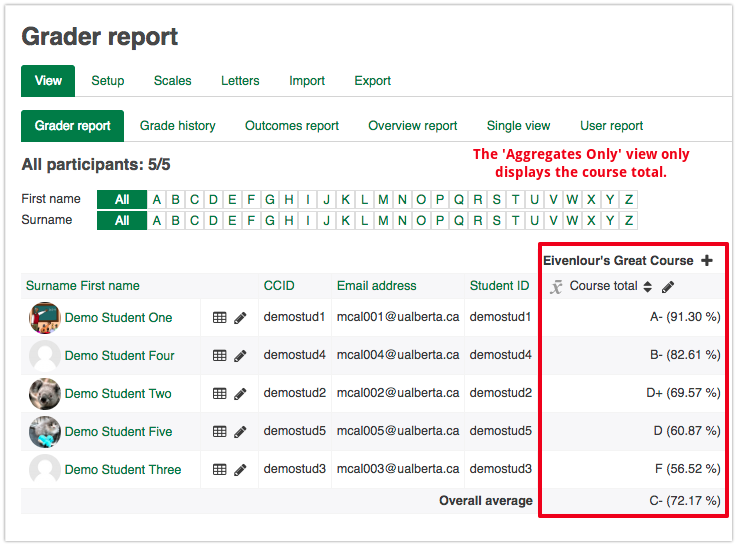 The 'Aggregates only' view displays only the course total and the totals of any categories in your gradebook. The 'Grades only' view only displays the grade items. If you are unable to find certain grade columns within your Gradebook, you may need to toggle between these views.